As a parent, choosing the best cot bed for your newborn can be tricky. With things to consider such as cost-effectiveness, the right look and feel, the durability factor and of course ease of use. With this in mind, we thought we would assist you with our choice of the five best cot beds that grow with baby, giving parents value for money whilst being uber stylish and made to last. And did we mention that they can all be easily converted? Enjoy! The beautiful Scandi design of the Flexa 5 in 1 Cot Bed brings so much value for money with its awe-inspiring conversion capabilities. Let’s have a look at the stages of conversion more closely. Excitement is ablaze as you bring your newborn home. At this stage, the mattress should be set to the highest setting enabling easy access for you and your baby. As time passes and your baby grows, they will be able to start sitting up, this is when you can lower the mattress to the bottom base level to ensure that they cannot climb out. From 2 years onwards, the smart function comes into play. What does this mean? Well, you can now remove 3 bars from the side of the cot bed giving your little one the freedom to explore. At the age of 3, you can remove the entire front giving your child an added sense of security whilst gaining some independence as your toddler transitions from cot to bed. 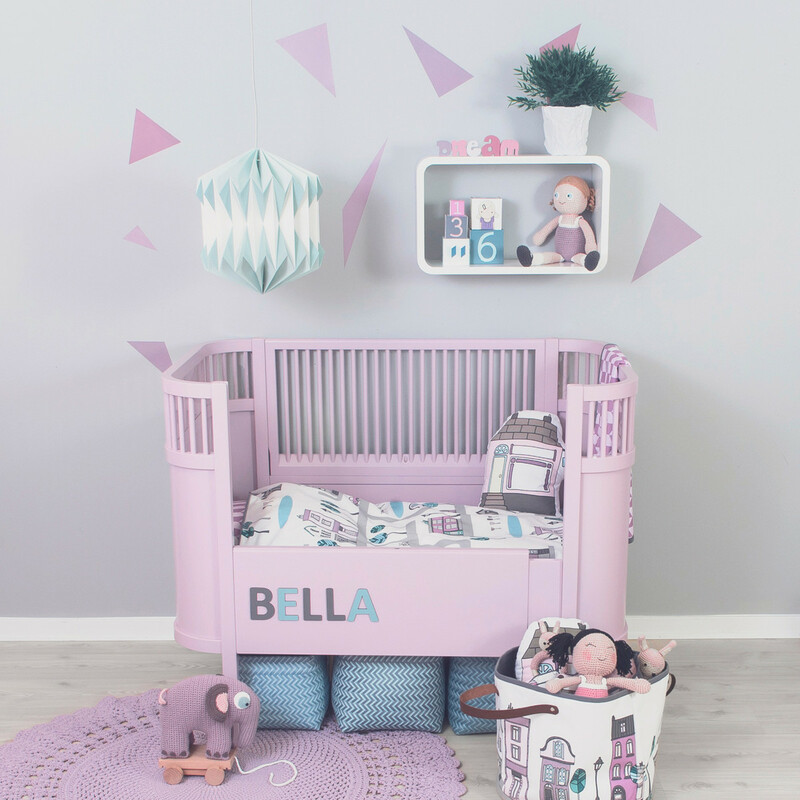 A year passes and your little one is ready for his/her own bed, now the Flexa 5 in 1 Cot Bed transforms easily into a beautiful toddler bed without any remaining bars. This cot bed is designed to last, so it can stay in the family, ready to welcome your next bundle of joy. If you are a lover of aesthetically pleasing design, not many compare to the beauty of the clean-lined Spot Cot Bed by VOX. Its acacia shell with white rails offers a contemporary yet timeless look, while the materials the cot bed is made of are of the highest standards in quality. Beauty aside, its the conversion to junior bed that really makes this a winner. With time passing by faster by the day, it’s essential to invest into baby furniture items that offer you longevity. The Spot Cot Bed is made of laminated board which is easy to keep clean and resistant to damage, so you can rest assured that it will last for generations to come, making it an investment piece. This cot bed grows with your child up to the age of 7. Simply retire the rails when your little one goes from baby to toddler, and you have a comfortable contemporary junior bed. 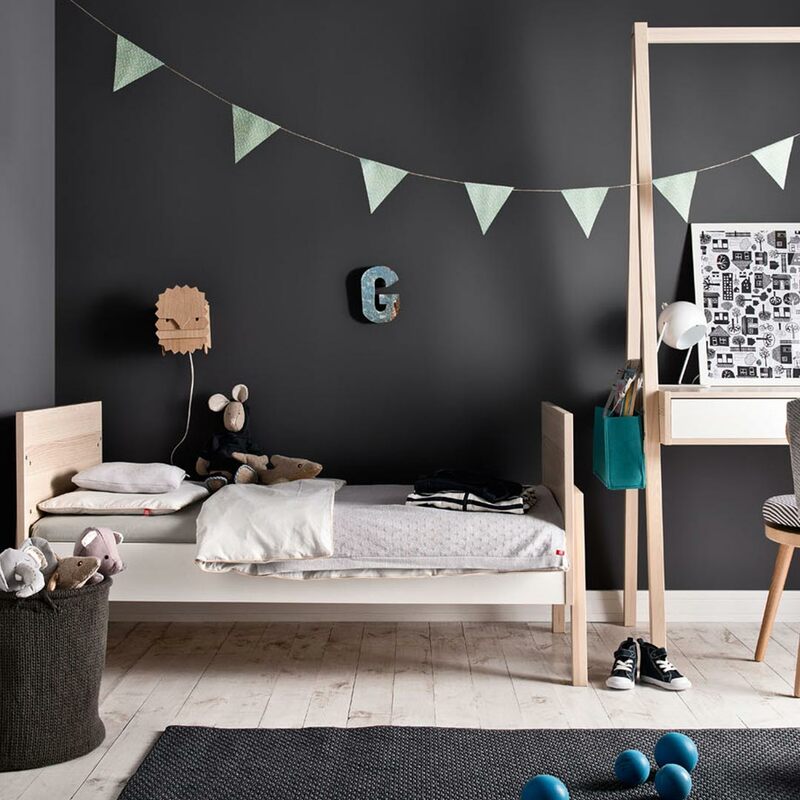 The beauty of this conversion is that the toddler bed truly functions as stand-alone toddler bed that looks and feels like a bed made especially for toddlers. 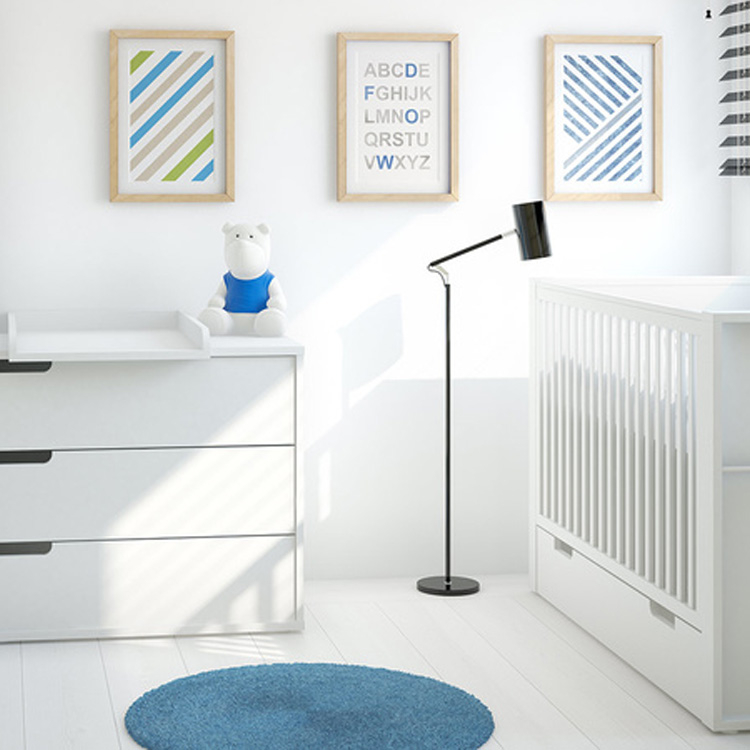 Notable is the Spot Compactum & Desk that goes beautifully with this Cot Bed. And as the name so clearly gives away, the compactum converts into a spacious desk where you toddler can spend hours drawing and letting his/her imagination free. The desktop lowers keeping a handy drawer and at the same time creating a stand alone drawer that can be used for toy storage. If you are a lover of function, design and exquisite quality the Leander Cot Bed has your name written all over it. With its elegant curves, made from beautiful beechwood and available in a choice of colours to suit any nursery style – this luxurious cot bed is an investment that not only caters to the needs of your growing child but also eventually can be used as a stylish smart sofa. How is this possible you may ask? Well, that is where the conversion capabilities come into play. With the simple use of an Allen key and a couple of screws, you can change the design and function. Start off with the bed in baby position, when your baby starts to stand or crawl lower the bottom of the bed to create a regular bed for your growing child. When your little one grows into a sprouting toddler, the sides and base can be changed with the kit provided when purchasing this beautiful cot bed. And hey presto, you have a junior bed for use up to 7 years! What makes the Leander Cot Bed even more special is the mattress that the bed comes with. Breathability in a cot mattress is essential for your baby’s well-being. The pressure-relieving cold foam core with drilled vertical air channels provides continuous air circulation, giving your baby maximum breathability and comfort. Furthermore, the mattress has two sides. The white side is designed with small knobs ideal for your baby’s weight, while the purple side has a wave pattern ideal for when your baby reaches the toddler phase. What pulls it all together is the zip-off cover with built-in mattress protector that offers excellent wetness protection and breathability for your baby, making little baby messes much less of a hassle. And the icing on the cake: it contains Tencel, which is a sustainable fabric that is as environmentally friendly as it is durable. Making the mattress 130 times more absorbent than its cotton counterparts. But that’s not where it ends, it is also quilted with 100% washable fleece and refined with lavender and melissa oil essences for their calming effect and effectiveness against bacteria. You can truly be assured that your baby will have only the best with this cot bed. 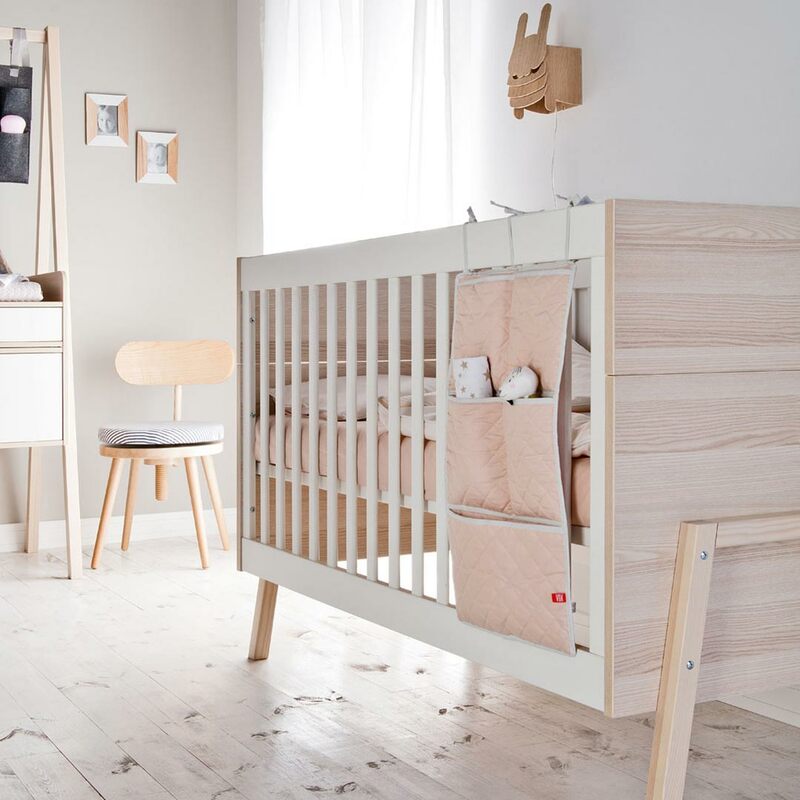 The Kili Baby Cot & Junior Bed from Danish brand Sebra has a unique design that gives your baby a sense of security. Made from birchwood and spray painted with non-toxic paint, you can be assured that this baby cot will be in the family for generations to come. The materials used to make the cot bed gives it durability and makes it easy to clean. Why it’s one of the best cot beds on the market is its ease of use and famous design. The Sebra Kili cot has a definitive look that distinguishes it from other cots on the market. Start by placing the base of the cot bed to its highest position for the infant phase of your child’s life, then once your baby can sit upright move the base to the lower position. When he/she starts to crawl simply remove one or both sides of the bed for the inquisitive little one to observe their surroundings. When your baby becomes a toddler, this cot converts and extends easily into a junior bed. With interchangeable parts included in the price, conversion is made easy by simply removing the two side pieces and extending the bed. This cot bed can be used up to the age of 7. The base has air holes, offering the all-important breathability factor for your growing baby. Because of its raised legs, you can easily store baby necessities below the cot bed. The custom-made mattress comes as two parts, so when it’s time to turn the cot into a child’s bed you simply ad the extra piece at the foot end. It’s as simple as that. The mattress is made of high-quality foam with an Oeko-tex cotton cover, meaning your baby will sleep in comfort with the highest standards in quality going into the manufacturing of the mattress. The mattress works hand in hand with the airholes in the base of the bed maximising on breathability. Also available in the range is the Kili Compactum, which follows the same design aesthetic and offers you ample storage with deep shelving units for all the things you need in your baby nursery. The words “classic”, “timeless” and “gracious” springs to mind when laying eyes on the Milk Convertible Cot Bed. Why? Because with its seamless design it is suitable for any nursery. What makes this cot bed stand out is the handy built-in storage drawer for easy access to all the things your baby will need as they grow. The cot bed base is adjustable to support the different phases of your baby’s development and to make those special moments between parent and little one easy and blissful. With a built-in railing at the foot-end of the cot bed, you can hang a fabric organiser to quickly store your baby’s bottle or favourite comfort toy. Conversion to junior bed is as easy as lowering the cot bed base to its lowest setting and removing the 2 rails on the sides of the bed. You can either keep the storage drawer or retire it for a lighter look and feel. To complete the look in your nursery, the Milk Compactum with Changer follows suit. Both the cot bed and compactum are made from durable laminated board, making them resistant to damage and easy to clean. Also notable is that both these items do not make use of handles, but instead cutouts that are designed to fit your hands easily, making it safe for your growing baby. What are your favourite cot beds? Share your thoughts with us in the comments below, we’d love to hear from you. Like us on Facebook to keep up to date with our latest blog posts and follow us on Instagram @cleverlittlemonkey for baby and kids furniture, decor, bedding and toys inspiration.